Google already provides you a tutorial on how you can add a domain to your blogger blog. 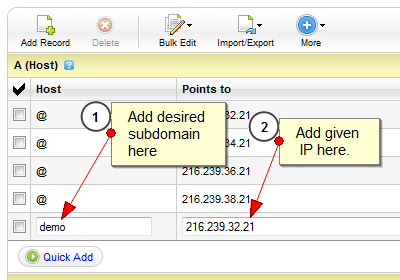 But it does not specifically show the steps for setting up two domains - 1. Main Domain 2. Subdomain for your two blogger blogs i.e. you will have two blogs one on main domain and the other on subdomain for example http://www.allbloggertricks.com and http://demo.allbloggertricks.com. Below are 3 easy steps with images on how you can add a subdomain to your blogs existing domain without any difficulty. Go to your domains registrar website and click on Change DNS/DNS Manager option. There you would find different CNAME and A records you have made previously for your main blog. Add another A name record with the the desired subdomain as your host. 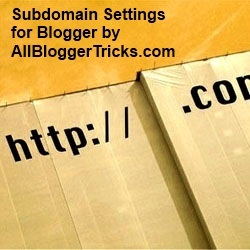 For example if you want subdomain http://demo.allbloggertricks.com/ for your blog then enter demo in the host name. In the IP/Point to section add this IP - 216.239.32.21 After adding save the record. Even after unchecking the box above, if the domain http://allbloggertricks.com (without www) redirects you to http://demo.allbloggertricks.com Go to Main Blog Title → Settings → Basic → Blog Address → Edit and check the box which states "Redirect allbloggertricks.com to www.allbloggertricks.com" Thats it, the whole setup is done. Sometimes if takes 1-2 hours for making the changes by the domain registrar but most of the time change is withing 5 minutes. Your custom subdomain is ready. And IF you are using BigRock, then you'll have to add a CName record for verification once when you setup your first sub domain, after that, no need to install, just A record will be enough, for the Cname, you'll have to go to Blogger > Settings > Basic > Edit > + Add a custom domain > Switch to advanced settings > settings instructions > and there, you'll find CNAME record to add, add them, and within 24 hours, your blog will be set up.! Hey but thing is it when will I make permalink for post how it will be work? Can you be specific about your concern please. BTW when it comes to working of permalinks it works all fine for me. really its very useful... but i want no redirects, direct sub domain name. can you help me? Is that possible to make sub domain with www like this >> http://www.blog.mydomain.com and http://blog.mydomain.com >> both works? I am using freedns to redirect my blog to my custom domain. Thanks a lot, this was a quick and precise way of creating a sub-domain for my blog. THanks again. I setup my domain with blogger but can only access to (www.example.com) but no to (example.com) and on the subdomain can access to (kitty.example.com) but no to (www.kitty.example.com) How can I fix this? ?